Hong Kong Synthetic Leather & Metal Material Suppliers’ Association (HKSLMMSA) has hold a voting of the President and Standing Committee for the Coming Year in a few days ago. At the result, Mr. CHENG Wing Ming (鄭永明先生) (See Photo) was appointed to be the “New President”. The creator of HKSLMMSA – Mr. Lai Man Hui (黎文煦先生) has the honor of being appointed to be “Forever Honor Association President”. And, Mr. Chan Yu Kit (陳宇傑先生), Mr. Ho Kwok Choi (何國材先生), Mr. Lau Shui Lung (劉穗龍先生), Mr. Lai Ha San (賴夏生先生) and Mr. 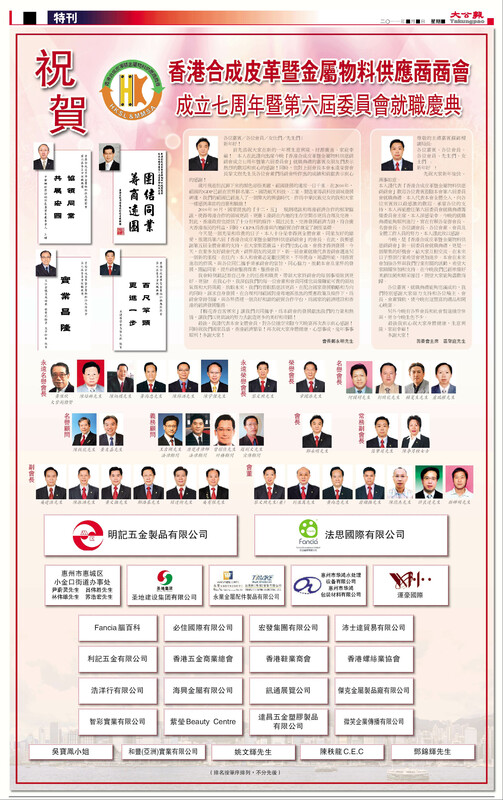 Lo Shui Kuen (盧瑞權先生) are appointed to be the “Honor Association Presidents” in coming year. A Gala Celebration Dinner for the Spring Festival, 7th Anniversary of Establishment and the 6th Inaugural Ceremony will be held in Paramount Banquet Hall in Kwun Tong at 4th March, 2010. HKSLMMSA is a Non-Profit-Marking Organization. The member is consist of Synthetic Leather, Leather, Sales of Metal Accessories, Wholesale, Logo Manufacturing and Individual in Hong Kong, China and Overseas Countries. Starting From November in 2002, the members of the HKSLMMSA talked over for interating organization. After 20 and more times of preparatory meetings, HKSLMMSA registed as a association Limited at 13th August, 2003. The Missions of HKSLMMSA are to unite the same businesses’ friends in Hong Kong, and act for the benefit of the same businesses; partiscipate the public affair, express the idea between the businesses and create better commercial environment through HKSLMMSA. To let Hong Kong as a foothold for facing China, by partiscipating China’s economic development and investment actively, the business communication and environment between Hong Kong, China and international Countries can be improved and enhanced. Therefore, much commercial potential can be created. seminars, entertainment events, Gala Celebration Dinners for the Spring Festival, and issuing Association Booklet 《會訊通》for gathering members and enhacing the communication between members. Moreover, HKSLMMSA particsipates actively in the activities of Hong Kong’s Industrial and Commercial Circles. Hence, the reputation of HKSLMMSA is increased and its development can be advanced.